In 2016, Chavonne founded Living 4 Purpose Enterprises LLC. L4P provide the roadmaps to make your dreams become your reality! L4P offers various services from business consulting, life coaching and resume revamping. In addition, Chavonne is an accomplished self-published author of the children’s books series, The Adventures of Amilya Rose. Her writing goes beyond just her books, she established her first blog in 2014 called “Real Conversation 4 Real People,” (justtalk4u.com) is an exploration of culture through conversation, without the restraints of political correctness. Now, equipped with applied knowledge, practical experience & CEO status…Chavonne is a visionary and strategist willing to work with all individuals who desire to reach the next level…Living4Purpose! 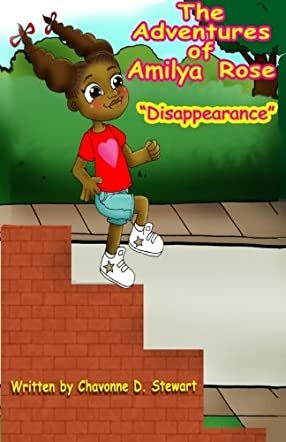 The Adventures of Amilya Rose: Disappearance by Chavonne D. Stewart is the second book in the series of adventures of Amilya Rose. Eight-year-old Amilya Rose is smart, dynamic, and creative, and in this story readers get to see her next adventure during summer vacation where she does a disappearing act. Summer vacation is her favorite time of the year as she gets to spend time with her grandparents and cousins, and also do a lot of fun things. She has already planned her next big adventure: visiting the new neighbors who have moved about six houses up from her grandparents. What is the lesson Amilya Rose learns from her new adventure? The story has some good messages, which makes it a must-read as children understand messages, concepts, and suggestions when narrated with the help of a story and pictures. It's a good bedtime storybook for children and can also be used for read aloud sessions in classrooms and school libraries. Amilya Rose learns the importance of telling the truth, and realizes that disappearing is not that cool and it can serious. She decides to ask permission the next time so that she can plan her adventures better. The story is also a fun read and children can connect well with Amilya Rose and her adventures. The descriptions are detailed and vivid, making all the scenes and characters come alive for readers. The writing style is simple and fluid, giving a good pace and movement to the story.